Not many hotels in the world can claim to have their own unique flower, but Kanuhura Maldives is the home of the Dendrobium Kanuhura, a rare golden yellow and orange orchid that flowers once a year. Bred especially for Kanuhura and officially registered as a unique flower by the Royal Horticultural Society in the UK, the orchid has just flowered for the first time since the luxury resort re-opened its doors in December 2016 following a full renovation. 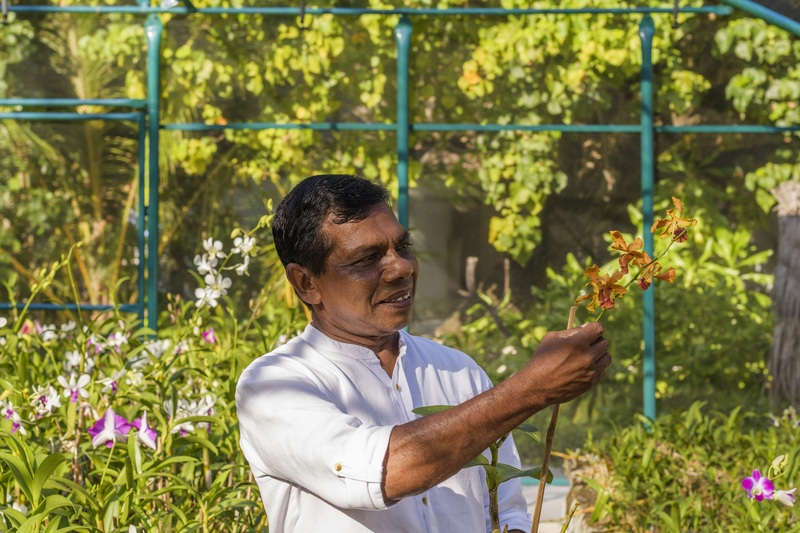 Bred by the resort’s head gardener Nimal Fernando in Kanuhura’s orchid nursery, the Kanuhura orchid is just one of over 7,000 orchids on the island and can be seen in the resort’s orchid gardens which are open to hotel guests. Nature lovers will also want to take time to explore the extensive gardens on the 1.4km island which are lush with orchids planted among indigenous plants and coco palms. This richness of tropical greenery is reflected across the island with orchids in every guest villa alongside beautiful greenery outdoors. As the resort heads into its high season (January through to May) with the postcard-perfect weather, luxury travellers can book themselves a bargain stay of 15% off best rates for early bird bookings and an additional 15% off room rates when staying seven nights or more. Room rates begin at US$1,014 per night for two in a Beach Bungalow on bed and breakfast basis in January. About Kanuhura Maldives: Set across three islands – two deserted islands and Kanuhura itself – the celebrated resort reopened in December 2016 after an 18-month full renovation, winning recognition from Conde Nast Traveller as one of the world’s top hotel renovations. Inge Moore of the London-based luxury hospitality studio Muza Lab in collaboration with Hirsch Bedner Associates redesigned the private island resort in the Lhaviyani atoll as a paradise for the world’s free-spirited jetsetters. One of the largest islands in the Maldives at 1.4km in length, Kanuhura has only 80 thatched-roof villas scattered throughout its untamed tropical interior and on stilts over the requisite turquoise lagoon. Kilometres of unspoilt beaches slope gently into the warm ocean while the two deserted islands are reached by a picturesque 5-minute boat trip, or can be waded to at low tide. Eight restaurants and bars offer a world of dining, including the not-to-be-missed Chef’s Herb Garden where candlelit dégustation dinners are served in the heart of the herb garden. Sun Resorts is part of the Sun Limited ‘Hotel Management’ Cluster. It owns and manages 4 hotels in Mauritius (La Pirogue Resort & Spa, Sugar Beach Resort & Spa, Long Beach Golf & Spa Resort, Ambre Resort & Spa) and the iconic Ile aux Cerfs a leisure island on which is nestled a championship golf course designed by Bernhard Langer. In the Maldives, Sun owns and operates Kanuhura Maldives, a member of Leading Hotels of the World luxury collection. Kanuhura Maldives, precious island languidly set on the warm Indian Ocean, in the middle of the bright atolls of the Maldives, can be described as a unique “timeless castaway chic experience” for travellers seeking laid-back island living at its best with a contemporary and stylish feel. Award winning Kanuhura Maldives, one of the first luxury resorts in the Maldives, offers the most unique experience to its visitors.